How to set up the newly-added functionality—and whether it's really worth it. As of early April, you can now play PlayStation 4 games right on your Mac. It’s not emulation, and no, the Blu-ray discs won’t work in your computer… assuming you even still have an optical drive. Oh, and you’ll need a PlayStation 4 console, of course. Sound complicated and/or convoluted? Surprisingly, it’s not: Thanks to the latest system update released for PlayStation 4, it’s now possible to stream games directly from the console to your Mac or PC over an Internet connection. With the Mac installer and a PS4 gamepad, you can tap into the digital and disc-based games on the most popular game console on the market today. And it works pretty well—at least under the most ideal conditions. But if you’ve got a shaky connection any step of the way, its value quickly disintegrates. 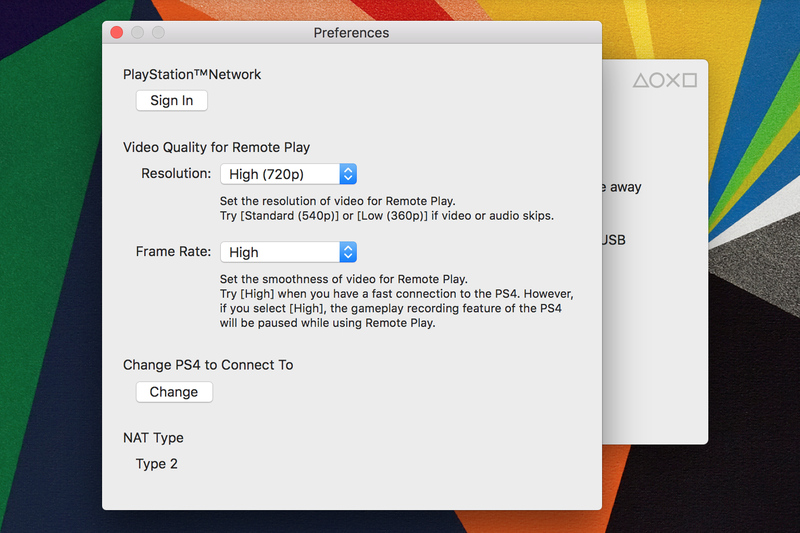 Still, if you’ve got a PlayStation 4 or are considering a console purchase, it’s well worth knowing about this added Mac benefit for when you’re traveling or simply want to play away from your TV. If you’ve got the connection for it, PS4 Remote Play is an awesome perk for console owners. Remote Play actually traces back nearly a decade to the PlayStation 3 and PlayStation Portable (PSP) handhelds, as Sony offered functionality that let you stream PS3 games to the portable system over the internet. That feature was later extended to the PlayStation Vita handheld, but few PlayStation 3 games ultimately supported it. 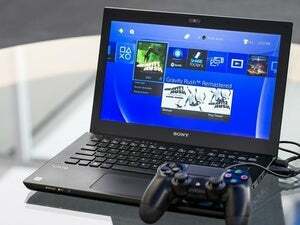 That changed when the PlayStation 4 came out, as Sony mandated Remote Play functionality with the Vita. Now you can play top-tier PS4 games, along with digital indies and old-school reissues, on the Vita wherever you are. And Sony has also brought the feature to some of its own Android smartphones and tablets, although not to other mobile devices just yet. Remote Play is available for Sony phones, but sadly not for iOS devices—yet, at least. In fact, this week’s update marks the first time that non-Sony hardware can be used to tap into Remote Play, as any Mac or PC that can run the app can feasibly run PlayStation 4 games. All the computing is still done on your game console, with your interactions rapidly transmitted to the PS4 and the gameplay footage just as speedily sent back to your screen. When it works well, the results are startling: You’ve got stunning, exciting PlayStation 4 games running on your Mac, even if your hardware couldn’t possibly run native games at that quality. But Remote Play is absolutely dependent on network quality, which can be a frustrating variable depending on your situation. It’s pretty straightforward, really. Make sure your PlayStation 4 has the latest system software version (3.50, as of this writing), then hit this link to grab the Mac installer for PS4 Remote Play. 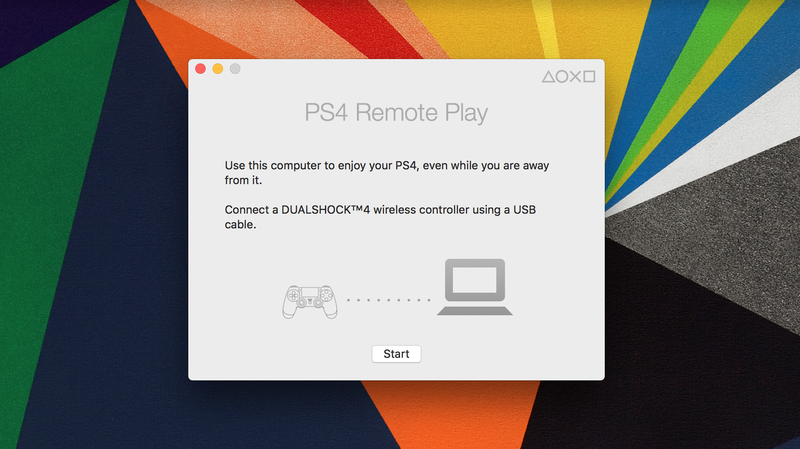 Make sure your PS4 is powered on, and then link the DualShock 4 controller up to your Mac via a USB charging cable—yes, it must be wired for Remote Play. 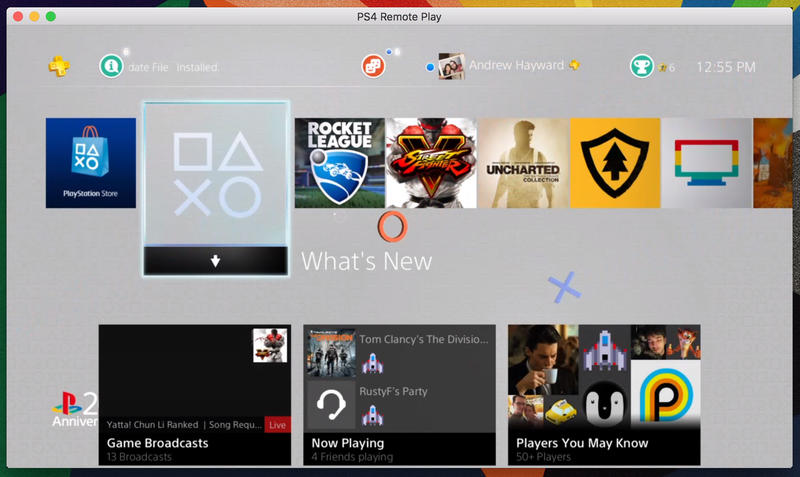 The free PS4 Remote Play app helps you get up and running within minutes. Click the button to connect to the PlayStation 4 over the internet, and voila, you should have the PS4 interface on your screen within moments. You’re effectively taking over the console from afar, and can do nearly everything you could do there: Play games, interact with friends, purchase new games, and more. You can’t watch streaming or disc-based media, however, presumably due to piracy concerns. How well gaming works via Remote Play is largely dependent on three things: The Internet connection your PS4 uses, the one you’re using on your Mac, and the performance settings. Your best bet is to hardwire the PS4 into your modem or router via an ethernet cable, although using Wi-Fi shouldn’t make a huge difference depending on your setup. Still, every bit of bandwidth counts, right? You can play it in windowed mode, but I greatly preferred full-screen. If you can use wired internet on your Mac, that’s even better—but less likely, given that modern MacBook models don’t even have ethernet ports. My 2014 MacBook Pro doesn’t, so I used wireless connections for all of my testing. But if you’ve got the option, particularly with a desktop, then you might as well use it. You’ll find the Remote Play settings on the Mac app, but they’re only accessible when you’re not connected to the PS4. From Preferences, you can choose between three resolution options—High (720p), Standard (540p), and Low (360p)—as well as High (60 frames per second) and Standard (30fps) frame rate options. It’s set to Standard on both counts by default, but you should experiment between the two based on the performance you’re seeing. The lack of 1080p streaming is disappointing, but it’s not surprising at all: The higher the settings, the more likely you are to encounter fun-killing lag and other hitches. And games still look great at 720p, anyway. I tried a handful of top PlayStation 4 games of varying genres and styles across multiple performance settings and connections—and by and large, Remote Play worked really well. But there were occasional or recurring hitches with every setting, and there are certain types of games I wouldn’t recommend enjoying through Remote Play. At max settings on my home Wi-Fi, separately tested with the PS4 connected both wired and wirelessly, a fighting game like Street Fighter V fared well. It’s fluid and still beautifully rendered at 720p and 60fps, although there are little hiccups here and there where frames drop or the connection loses a step. It’s totally solid in single-player, but I wouldn’t try to play it competitively online over Remote Play, given the need for precision. The same goes for Rocket League, an awesome indie hit about soccer-playing cars—which is slated to hit Mac soon, but is still missing in action. It’s a lot of fun over Remote Play, whether playing solo or in online matches, but the split-second delay in reaction time can really botch an expert play attempt. Also, I encountered obnoxious stuttering audio across the board, no matter the performance settings—but it’s the only game that gave me that issue. The raucous Rocket League is headed to Mac at some point, but for now, you can enjoy it via Remote Play. The best Remote Play games are those with a slower, less-constant pace—or the ones that you can pause if your connection gets funky. First-person adventure Firewatch (also on Mac) is a pretty ideal one, given the leisurely approach, along with gorgeous puzzler The Witness. Big-budget action game Uncharted 2: Among Thieves, part of The Nathan Drake Collection of remastered PS3 games, looked and played pretty amazingly over Remote Play, and it’s the kind of game you won’t find on Mac (Tomb Raider is the closest analog). And when lag popped up, I’d just hit the pause button and wait a moment. Lag is annoying, but at least you can rebound easily with games like that. Next month’s much-anticipated Uncharted 4: A Thief’s End will be playable via Remote Play, and it’s exclusive to PS4. Bumping down to 540p resolution wasn’t as huge of a drop as I anticipated: Games still looked pretty good, and it’s a fair trade-off for performance. That’s definitely not the case at 360p, however, which nearly wrecked Rocket League with its super-fuzzy feed. It’s hardly worth playing PS4 games if that’s all your connection can muster. As for frame rate, the difference between 60fps and 30fps can be major, especially with a game like Street Fighter V, but your mileage may vary there. My home Wi-Fi—in Chicago, via Comcast—is pretty steady, providing 60-75mbps download speeds. Just as an experiment, I tethered my MacBook Pro to my Verizon network on my phone, which offered closer to 40mbps speeds, and I didn’t see much of a performance difference at max settings. Still, 40mbps is a lot better than you’ll find at the average hotel, and you may need to play with the performance settings to deal with weaker connections. Sony says a 12mbps connection (upload and download) is recommended, but that’s probably not at max settings. Ultimately, connection stability seems to be the biggest concern: If your internet is inconsistent, you probably won’t have a very good Remote Play experience. Sadly, the app won’t analyze your connection and suggest ideal settings, or adjust on the fly: you’ll need to tinker a bit. As a free, value-adding perk for Mac and PS4 owners, absolutely: Remote Play offers the option to play your console games from afar, and under ideal circumstances, the experience is great. It’s especially beneficial on Mac as opposed to PC, given that top multiplatform games are less likely to release for Apple’s platform. Playing on the road is the obvious example, letting you chip away at games when you’re far from home, but it’s useful even when you’re in the same location as your PlayStation 4. 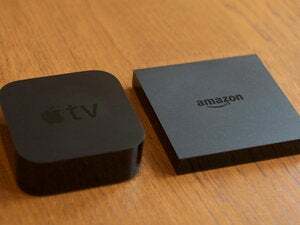 You can bring your MacBook out to the porch or into bed, for example, or enjoy PS4 games even if your television is being used by someone else in the family. Remote Play isn’t without downsides and caveats, and if your connection isn’t up to snuff, it’s hardly worth putting up with loads of lags and disconnects. I wouldn’t recommend running out and buying a PS4 just for this feature without trying it first, perhaps with a friend who already has the console—but as a bonus feature, it’s very cool and potentially quite useful.